Because hydraulic power is used in everything from automotive brakes to industrial robots, the skills taught by Amatrol’s Basic Hydraulics Learning System (85-BH) can open the doors to careers in various fields, such as manufacturing, transportation, agricultural, and construction. Basic Hydraulics training introduces the fundamental hydraulic principles, such as pressure and flow, while simultaneously teaching industry-relevant hydraulic skills; this signature Amatrol approach to curriculum reinforces both theory and practice, which produces a well-rounded understanding of the topic. As an example, after completing this training system, learners will not only be able to basic hydraulic operation, installation, design, and troubleshooting for various applications, but also understand concepts like flow rate versus cylinder speed and pressure versus cylinder force. Basic Hydraulic training includes gauges, manifolds, cylinders, valves (relief/sequence, pressure reducing, check, directional control), flow meter, and hydraulic motor. These components are all industrial quality to ensure durability and help learners become better prepared for what they will encounter on the job. All Amatrol products are made from top-notch materials and carefully crafted (hand-welded, painted, and silk-screened) to create tough, attractive, well designed industrial training systems that facilitate learning and will serve teachers and students for years. Within the Basic Hydraulics curriculum, learners begin by studying about the physical principles of hydraulics and how hydraulic mechanisms are used in real world applications. From this building block, learners begin hydraulic circuit construction, which gradually increases in difficulty and number of industry-standard components as the curriculum goes along. By taking this approach, learners will understand each component’s function in a circuit, which makes hydraulic troubleshooting easier in later lessons and on more advanced training systems. Learners will also study about pumps, gauges, hydraulic motors, cylinders, and numerous valves, including schematic symbols for each component, creating the ability to read and draw their own hydraulic schematics. 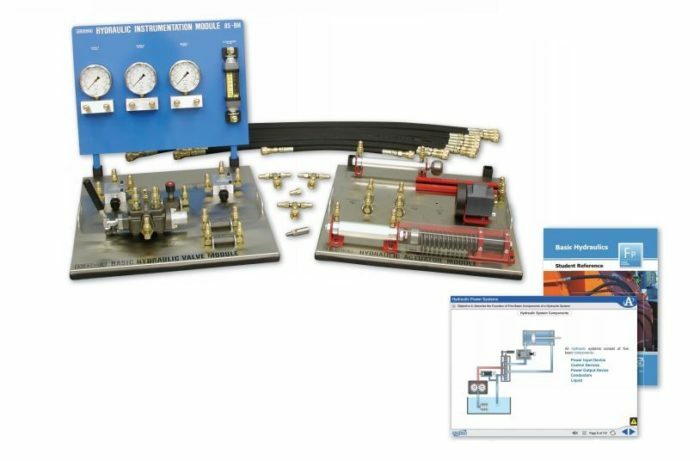 Each Basic Hydraulics training system features standard industrial grade components. This attention to quality gives learners experience they would normally only get on the job by helping them recognize industrial components and how to troubleshoot them more effectively. Components included with Basic Hydraulics are pre-mounted on circuit panels with silk-screened labels next to each, which facilitates ease of use and identification. Additionally, the system’s orderly, user-friendly design helps learners to easily recognize how each component fits into a hydraulic circuit. Within the basic hydraulics training curriculum, learners begin by studying about the physical principles of hydraulics and how hydraulic mechanisms are used in real world applications. From this building block, learners begin constructing hydraulic circuits, which gradually increase in difficulty and number of industry-standard components as the curriculum goes along. Learners will also study about pumps, gauges, hydraulic motors, cylinders, and numerous valves, including schematic symbols for each component, creating the ability to read and draw their own hydraulic schematics. Amatrol’s hydraulics curriculum is presented in an interactive multimedia format. This format features stunning 3D animations, video, voiceovers, and interactive quizzes. This multimedia also includes the basic hydraulics Virtual Trainer (NB831) that recreates hydraulic equipment in such realistic detail that learners can seamlessly transition to actual hands-on equipment. Learners can build on the skills they have acquired from Basic Hydraulics by moving onto the Intermediate (85-IH) and Advanced (85-AH) Amatrol Hydraulics, as well as the Electro-Hydraulics (85-EH). For convenience, Amatrol offers Basic Hydraulics (85-BH) as part of the Basic Hydraulics package (850-H1), which also includes an Amatrol workstation (850-CTB) that features welded-steel frame construction for durability, lockable casters for mobility, slide-in storage racks, and the Hydraulic Power Unit (85-HPS). A sample copy of the Basic Hydraulics Student Reference Guide is also included with the system for your evaluation. Sourced from the system’s multimedia curriculum, the Student Reference Guide takes the entire series’ technical content contained in the learning objectives and combines them into one perfect-bound book.